LONDON - A proper "speeding Beady Eye" article by the brother of Oasis, about the great driver of English cars only, Toleman, Lotus, McLaren, Williams. The Grand Prix jacket by Pretty Green (Paul is a fan of the brand) is clearly inspired by races. Now I'm not a Motor Racing fan, the thought of 24 cars hurtling around tarmac in single file for a time,which then spring into life with the odd bit of dangerous driving and skill combined, didn’t appeal to a football fan like me, but watching the new documentary movie SENNA ($25=£15) changed my opinion slightly. Ayrton Senna was a passionate Brazilian motor racing driver who started his life in go-karting and took that right through to the very top of Formula One racing. He was uncompromising, skilful and a bit of a stock car racer underneath. He didn’t care too much about his opponents or their reputations; he wanted to do one thing only and that was WINNING at all costs. His much-vaulted battles with Alain Prost pretty much takes over the movie. It's refreshing to see a Frenchman like Prost talk candidly about his battles with Senna, his personal feelings about a man who was his rival, team mate and his friend over their racing period. Some say the car maketh the driver, but when Ayrton Senna left McLaren to join Williams / Renault his whole driving skills were compromised by NEW electronic equipment. The cars were different; it was basically an electronic gadget on wheels. Senna was left with no choice but to try and drive like he had always driven which was fast, and if you see a gap take it. With the new cars this wasn’t possible as their design would take over the natural runnings of the vehicle with cars spinning off the track becoming the norm. Alain Prost won four world titles then retired because he didn’t want to share driving duties with Senna. Ayrton won three world titles and left to join Williams / Renault. After 6 months or so he learned to regret this decision. The cars were not right, the burning desire to equal Prost's four titles and the desire within him, even after witnessing the death of Roland Ratzenberger on the track some hours before, toyed with his mind. Senna knew his car wasn’t right. He spent times with the designers to try and get the steering correct, this ultimately cost him his life at the San Marino Grand Prix on 1 May 1994 when he spun off and was killed by a faulty steering column. Nothing of this becomes clear in the movie, a lot of questions are left unanswered, the Marshalls, the medical people, could they have saved him by reacting quicker, he was just 34 years old. The outpouring of grief at his funeral back in Brazil where some THREE MIILLION people turned out, brings it home that this man was loved in his country, revered in others he was a national and international hero worldwide. 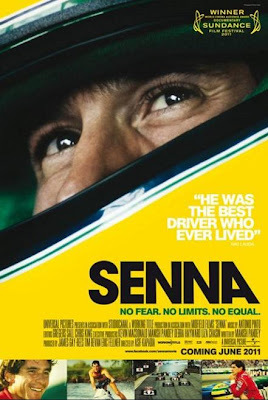 The documentary is a fascinating insight into Formula One for any fan or any non-fan who was ever interested in the enigmatic and God loving Brazilian that was Ayrton Senna.